Winger Ivan Sproule will return to Hibernian after signing a pre-contract agreement with the Easter Road club. The 30-year-old Northern Ireland international will move from Bristol City, whom he joined four years ago after making 94 appearances for Hibs. He told the club's website: "There is nobody happier than me. 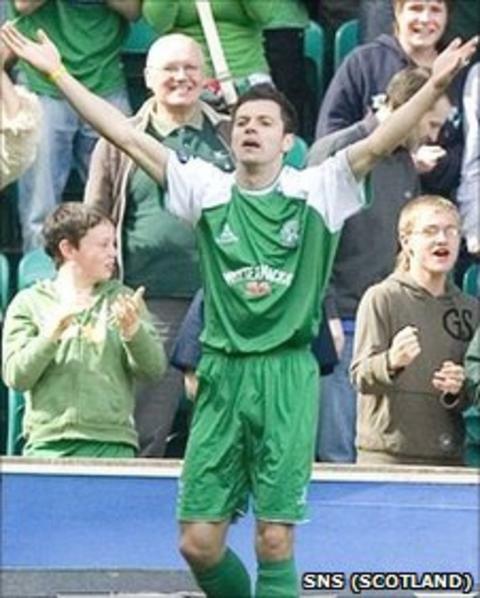 I feel I'm returning in order to give something back to Hibs and that I'm coming home. "I want to help this crop of young players to achieve some great moments." Sproule moved to Ashton Gate from Hibs in a £500,000 deal but he struggled to secure a regular start for the Championship outfit this season. He was farmed out to Yeovil in November and was also on loan to fellow League One strugglers Notts County. "The gaffer is building a side that can climb up the table again and hopefully my experience can help make sure that happens," added Sproule. "I had a few opportunities to stay down in England, but I told my agent that this was the place I wanted to come back to. "Coming back, I would say I'm a much stronger and wiser player than I was when I left four years ago. "When I went to Bristol City, I felt it was the right move, although I was very disappointed to leave Hibs. "I left a lot of good friends and good memories at the club. The fans were always great to me and, even when I was playing for Bristol City, I would get more fan mail from Hibs supporters than from Bristol City supporters." Hibs manager Colin Calderwood said: "Ivan gives us a bit of what we were looking for in terms of genuine pace and personality plus he adds another experienced voice in the dressing room. "The fact he has been at the club before means the settling in period will be quicker." Sproule, who moved to Easter Road as an amateur from Northern Irish club Institute in 2005, won the League Cup with Hibs two years later. He famously netted a hat-trick as a second half substitute to give Hibs a 3-0 win over Rangers in his debut campaign.